A big-rig overturned Saturday morning, leaving the driver in serious condition. - May 24, 2014. All lanes of northbound U.S. Highway 101 near Millbrae Avenue and the westbound Millbrae off-ramp closed Saturday morning after a big-rig overturned, spilling produce across the highway, according to the California Highway Patrol. Southbound lanes were closed for several hours Saturday morning while emergency crews worked to get the driver out of the wreckage. 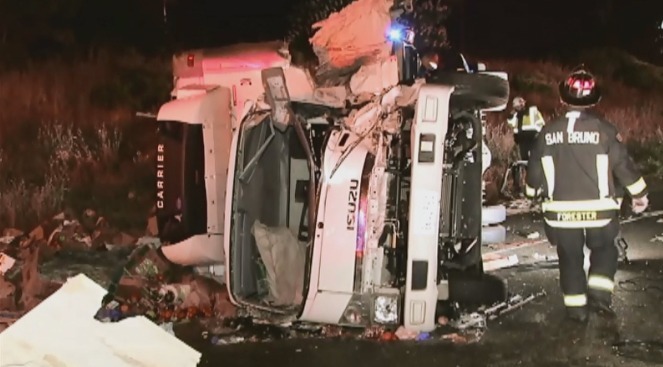 The accident occurred at about 3 a.m., when the truck, traveling northbound, overturned, trapping the driver inside. The driver was airlifted to Stanford Hospital and was listed in serious condition. No other injuries have been reported. Southbound lanes were unaffected by the crash, and remained open. A dump truck was dispatched to the scene to removed spilled produce and debris from the roadway, according to the CHP.